Instagram has been improving many of their features for a while. Their new algorithm, changes in the feed and other updates have totally changed, and improved, the way Instagram is perceived by individuals and businesses alike. But the biggest improvement in a long time has been Instagram Insights. 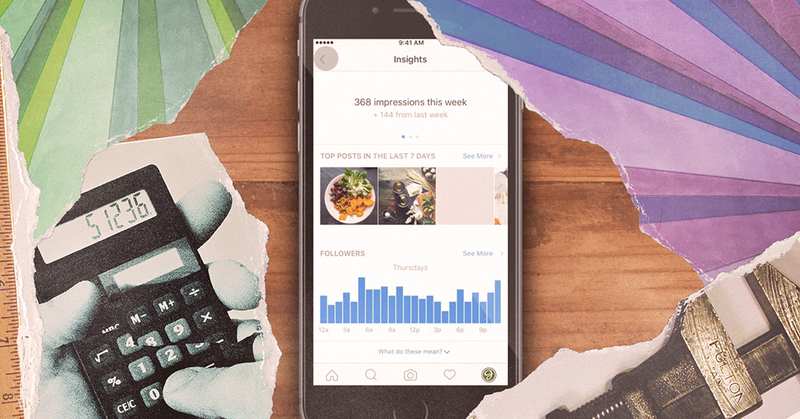 Instagram Insights is a free feature on Instagram that helps you learn more about your followers and about how your content is being received by your audience. So, basically, this is a step closer to getting your own data-driven Instagram marketer. The feature allows users to measure the performance of their content by showing them the analytics of the content. It also allows you to view specific posts and stories you created to see how each one of them is performing and how your audience is engaging with them. Instagram Insights is only available to business accounts. If you don’t have a business account yet, you may be missing out on interesting data about your account. Changing to a business account is actually pretty easy. Go to your Instagram account and tap the button with the three lines. Simply tap “done” and that’s it! Now you’ve got your own business account and nothing can stop you anymore from getting insights into your Instagram data. It’s recommended that you connect your Business Instagram account to a Facebook Page associated with your business. This will create a bridge between your two channels, which will make it easier to share your content on both pages. In addition to that, make sure you add all the important details of your business, like contact information and a short description of what your business does or sells. This way new people visiting your page will know who you are and how to contact you when they’re interested or have any questions. To be able to view your insights, go to your business account and tap . Next, tap the “Insights” button. This will automatically open up your Insights. The insights that you’re able to view from your profile are Activity, Content, and Audience. The activity tab in Instagram Insights shows important insights from your profile, including interactions (profile visits and website clicks) and discovery (how many people see your content and where they found it). You can track weekly interactions, reach, and impressions. This subsection shows the total number of interactions on your account for the past week. It also shows a few other statistics. At the top of the page, you’ll find a bar graph that shows which day of the week received the most interactions. You can also find a comparison between the interactions from the week prior. Unfortunately, these Activity Insights are limited to one week only, which does not provide you with a lot of information in the long run and might not be very helpful for your strategy. The total amount of visitors to your Instagram page in the measured period. This is the number of people who actively visited your page. The total number of users who’ve clicked on the website link in your Instagram bio. The total number of users who’ve clicked on ‘E-mail’ on your profile, if you added an email address to your bio. The total number of users who’ve pressed ‘Call’ on your profile, if you added a phone number to your bio. This subsection shows the overall performance and influence of your Instagram account. It uses two key statistics. Again, at the top of this subsection, you’ll see a bar graph. This bar graph shows how many accounts were reached by your content in the measured period. The total number of unique accounts that have seen any of your posts. This means that your content has made it onto the news feed of that number of people. The total number of times that all of your posts have been seen. If this number is higher than reach, it means that some of your audience have interacted with your posts more than once. These people are most likely your followers as they tend to see more of your posts and Instagram Stories. Tracking the information from these metrics can be important for your business as you’re able to compare changes in reach depending on specific campaigns or activity on your channel. It helps you can measure the success of the efforts put into your strategy. This tab shows you the Instagram Insights relating to individual posts on your profile. This includes photo and video content, stories and even any paid posts you may have published. This part shows the insights on your feed posts, stories, and promotions. This subsection lets you see how your posts, stories, and promotions are performing. This metric automatically sorts photos by how often they were seen in the last year, but you can change what they’re sorted by and for what time period to fit your purposes; for example, by engagement for the last week. You can play around with it a bit and figure out what best fits your strategy and business. Here, you can see the total number of impressions you got on your stories in the past 14 days, but this can also be altered to suit whatever your needs may be. This number is, unfortunately, not available in a line chart to visualize the over time performance in Instagram Insights. Luckily, we at quintly built exactly that. This metric will only appear if you’re actually using promotions. It’ll show the Instagram Insights for your paid posts. From there, you can see the demographics of the people who were reached by your content. To find out how to approach Instagram ads and, more importantly, the analysis of Instagram ads, read our dedicated in-depth article. The section shows more about your followers and audience demographics, and when they tend to be online. It helps you understand more who your audience is and how they’ve grown in the past week compared to the previous week. The data received from this subsection will help you make your content fit better with your audience because now you’ll know their age, gender and where they’re from. This subsection shows a bar chart of where your audience is from, divided either into cities or countries.When you tap the bar graph, it will also show the percentage of people that are from that location. This shows a bar chart of what age range your audience is in. You can divide it into women and men. This metric provides a pie chart of what gender your audience is. This is actually an interesting metric because the gender of your audience is determinative of what your content should look like and to whom you should target your ads. There is very often a big difference in what women and men enjoy seeing on their Instagram feed. This shows when the best time for you to post on your Instagram is, helping you plan better exactly when to post by showing you peak times per day. You can check out which hours are best on specific days or what days are the best for you. If that overview is not enough for you and you would like to know in greater detail when to post, our article on the best time to post on Instagram will help you! A big downside of Instagram Insights is that a lot of the metrics only show data from one week, and you’re not able to go back any further. This doesn’t necessarily have to be a problem. If you’re a small account, seven days may be enough for you; it will provide you with all the data you need. But if you’re a bigger business, seven days will most likely not provide you with enough historical data to really be able to compare changes in reach or other metrics. Instagram Insights is certainly a great start to get in the data game, but is not enough if you’re not a newcomer. A social media analytics tool is a lot more advanced if you want to analyze your Instagram channel more closely and easily see data at a glance. With quintly, you can track the data from your channel without any limitations. The tool can also be used for benchmarking and tracking the data from many other social media platforms.